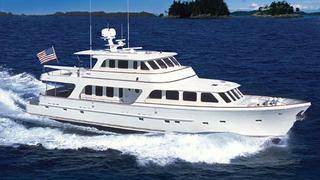 News from Michael Nethersole at Northrop & Johnson that he's just signed the 24.4m motor yacht Grits for sale. Built by Voyager in 2006, her construction is superb, with solid laminate below the waterline in the one-piece hull and closed-cell in the topsides, and superstructure for stiffness and light weight. Accommodation is for six guests in three staterooms - two doubles and a twin. In the saloon, Grits has an L-shaped sofa to starboard, a pair of comfortable armchairs and a large television on the port side. The mahogany panelling has a strongly-grained pattern, accented by cherry burl used for the horizontal surfaces. Unnoticeable but important, every living area on the lower deck has an emergency access hatch. The owner's cabin opens into a foyer that has a watertight door into the engine room, as well as stairs leading directly to the port deck. The boat deck has upgraded twin settees and a 2,500-pound crane easily handles the 15-foot Nautica tender, while the outside entertainment amenities include a grill, refrigerator and sink. Twin 1,015hp Caterpillar engines give Grits a cruising speed of 14 knots and maximum speed of 16.5 knots. Lying in St Augustine, Florida, Grits is asking $3,850,000.